Happy New Year, and welcome 2016! The last week of 2015 finally brought a bit of winter weather with just enough cold air to deliver a modest storm, easing us into winter in a gentle manner. One of the most stunning moments of a New England winter storm is when the sun breaks out the following morning, illuminating the landscape with dazzling light. Just at sunrise some scattered breaks in the clouds let a few rays though the cover. And soon mother nature had unfurled enough of the sky to reveal the spectacle that is New Hampshire in winter. It was a nice dense snow, heavy enough to bear a ski trip on fairly even terrain without hitting bottom, though only for a day or two as warm temperatures thinned it out quickly. There wasn't a lot of opportunity to discover who's out traveling around the lake, as a crust soon formed on the top so the animals don't leave footprints. But I saw deer prints, a few fox prints, and these weasel prints the morning of the storm. The crust was partly due to a thin layer of freezing rain which fell after the snow; light enough to not cause any problems with power lines, but just enough to cast a crystal layer on the world. 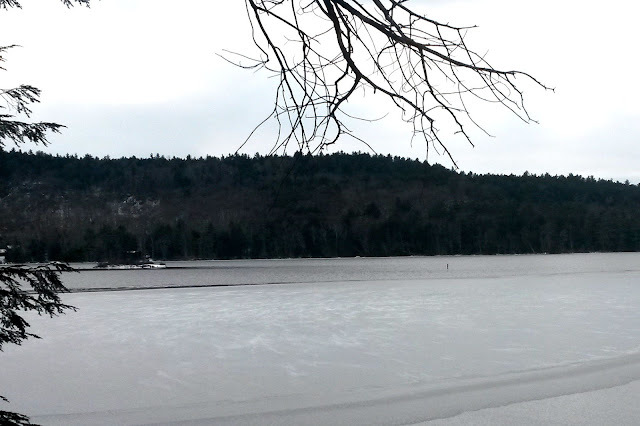 This winter will at least tie the record for the latest ice-in date I have seen on Lake Wicwas. As of today there is still open water on the lake. Ice-in usually happens sometime in the first three weeks of December; I have only seen it wait until January once, and that was the winter of 2012-2013 where it froze over on January 4th. I think there's a good chance it will freeze up tonight or tomorrow, but with winds forecast for the next couple of days we'll have to wait and see - it may be the latest ever. One of our lake friends did observe that aliens had tried to land on the still-soft surface, but then thought better of the decision (thanks NC!). With cold temps and snow we decided it was safe to bring out the bird feeders and within hours the first visitors had arrived: gold finches, in droves. They were soon followed by the chick-a-dees, nuthatches, juncos, and woodpeckers. The birds have clearly abandoned their summer homes even if they're staying north for the winter. It took a while, but the glory of winter is finally here in New Hampshire.